It was there that David and Fahmi died - the first Israeli soldier and the first resident of Nusseirat to lose their lives in conflict that has since seen nearly 1,000 Israelis and 3,000 Palestinians killed. Using home videos and memories of family and friends, THE JUNCTION shows the ripple effects on their loved ones and their communities. David's sister remains angry at the meaninglessness of his death. His parents have left his room untouched, except for changing the sheets once a week. His dearest friend, El'ad, committed suicide. And David's surviving army buddies are disillusioned. For Fahmi's family, his death is a personal tragedy and one more injustice perpetrated by the Israeli occupiers. His mother's family was forced out of their village when she was a baby, and his uncle decries the misery that follows them from generation to generation. Once a busy intersection and a teeming neighborhood, the area is now a militarized desert.The Palestinian homes, orange groves, and greenhouses that surrounded the crossroads have been reduced to rubble and sand; a metaphor for the trap that has imprisoned both Palestinians and Israelis. 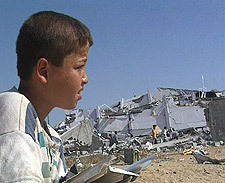 Nothing remains except the Israeli settlement that David's unit was tasked to protect. The narrative spine of THE JUNCTION is confined in space and time, yet reaches far into the social fabric of both societies to explore the culture of death that feeds the political impasse, and the violent convolutions that are currently consuming both Israelis and Palestinians. The first sober, in-depth examination of the history of suicide bombing. Filmed in Iran, Lebanon, Sri Lanka, Israel, Palestine, Europe and the United States.